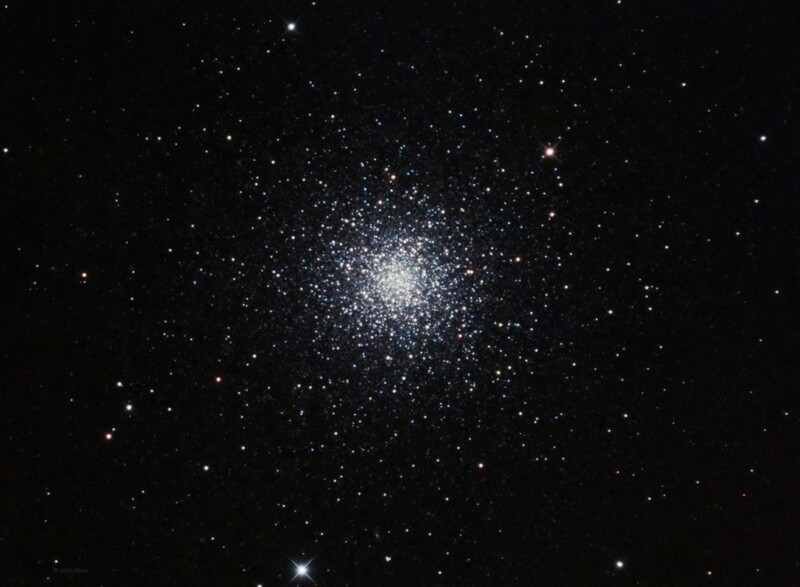 Messier 3 is a globular cluster in the constellation Canes Venatici. M3 shows well in short exposure due to its large size and it is also fairly bright at magnitude 6.2. There are about 500,000 stars in this cluster with a dense core of about 12 arc minutes diameter with reduced density out to about 18 arc minutes diameter. The age of the cluster is about 8 billion years and it is 33,900 light years away. This cluster contains a large amount of variable stars and also blue straggler stars. Over 200 variable stars have been cataloged and most are classified as RR Lyrae variables which have regular periods of less than one day. Blue stragglers are older stars that are much hotter than the surrounding stars. This is unusual in globular clusters as all stars form at about the same time and therefore should be fairly uniform in age. One theory about blue straggler star formation says they are older stars that have merged together from gravitational interaction and as a result are hotter that the surrounding stars. Another possibility is the stripping of outer layers from the star from interaction with other stars.